An inexpensive placemat can easily become a roll-up organizer. Just one fold and a handful of straight seams, and you’re done. Dollar Store Crafts shows how to do it. 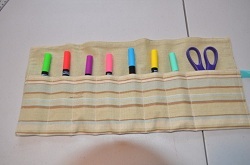 Change up the size of the pockets to make it an organizer for markers, make-up brushes, knitting needles, etc. Get the tute.